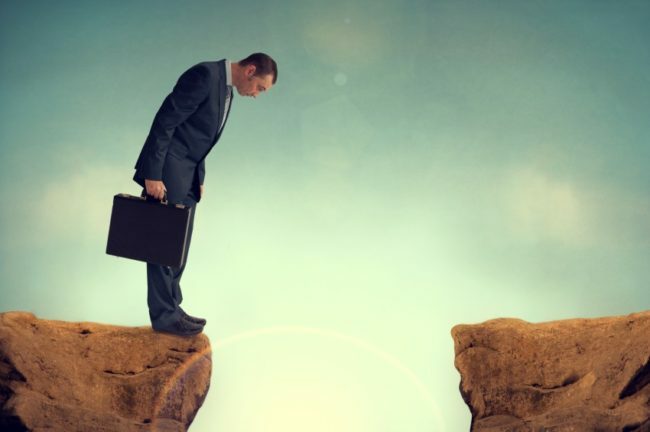 Summary: This sixth SBE Council “Gap Analysis” looks at the issue of job growth. Over the past near-decade, including the current period of recovery/expansion, since economic growth and investment have come up woefully short, there have been vast shortfalls in labor force participation and the level of employment. That is, job growth has been grossly inadequate. In fact, if the U.S. had a reasonable level of employment relative to population, there would have been 8.1 million more people employed in September 2016 than actually were working. Labor Force. In terms of labor force participation, the most drastic change came with the recession that hit in late 2007 and lasted to mid-2009, and during the subsequent poor recovery/expansion period. The labor force participation rate stood at 66.4 percent in early 2007, and then declined dramatically, hitting a recent low of 62.4 percent in September 2015. That level was last seen in late 1977. Since September 2015, the rate has moved back up slightly to 62.9 percent in September 2016. In September 2016, if the labor force participation rate had registered 66.0 percent – where it was just before the recession started – the U.S. labor force would have been 167.7 million, as opposed to the actual 159.9 million. 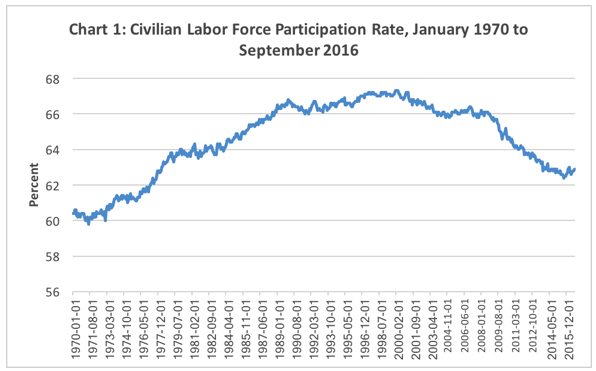 That is, the labor force in September 2016 was down by 7.8 million compared to where it should have been at a reasonable participation rate. Not An Age Thing. The falloff in the labor force really cannot be attributed to an aging population. It turns out that the labor force participation rate was lower in 2015 for all age groups except those 55 years and up. So, when comparing the labor force participation rates of age groups in 2015 and 2007, it turns out that the decline in the labor force due to lower participation rates is all about the age groups below 55 years old. That is, the labor force in 2015 was down by 13.1 million compared to where it should have been at reasonable participation rates for ages 16 to 54. Employment. Once this last recession kicked in, the decline in the employment-population ratio was dramatic, eventually bottoming at 58.2 percent in late 2010 and at various points in 2011. Such lows had not previously been seen since the early 1980s. As of September 2016, the employment-population ratio climbed back to 59.8 percent. That compared to a pre-recession level of 63.0 percent. In September 2016, if the employment-population ratio had registered 63.0 percent – again, where it was just before the recession started – the U.S. level of employment would have been 160.08 million, as opposed to the actual 151.97 million. That is, employment in September 2016 was down by 8.1 million compared to where it should have been at a reasonable employment-population ratio. Over the last several years, the labor force and employment numbers have been spun in a variety of ways to deflect attention from the data. But the numbers clearly show a dramatic exodus of workers from the labor force and a drastic shortfall, or gap, in terms of employment. Over the past decade, the U.S. shifted from a few years of respectable economic growth to a long and deep recession, and then to one of the worst periods of economic recovery and expansion on record. As the nation looks to a new presidential administration and a new Congress taking power in January 2017, SBE Council is publishing a series of analyses that highlight key gaps or shortfalls in our economy. The first analysis focused on the GDP shortfall, the second on a lost decade of private investment, the third on the decline of entrepreneurship and millions of missing businesses, the fourth on poor U.S. productivity growth, and the fifth on Americans’ suffering lost income. This sixth report on jobs will be followed by an analysis on trade, with a final report highlighting the basic policy changes needed to close these gaps. “Gap Analysis #6” looks at the issue of job growth. The reality is that over the past near-decade, including the current period of recovery/expansion, since economic growth and investment have come up woefully short, there have been vast shortfalls in labor force participation and the level of employment. That is, job growth has been grossly inadequate. The labor force participation rate stayed on a generally growing path into early 2000, when it hit a high of 67.3 percent. The late 2000 slowdown, 2001 recession and sluggish recovery saw the rate dipping slightly and basically stagnating. The most drastic change came with the recession that hit in late 2007 and lasted to mid-2009, and during the subsequent poor recovery/expansion period. The labor force participation rate stood at 66.4 percent in early 2007, and then declined dramatically, hitting a recent low of 62.4 percent in September 2015. That level was last seen in late 1977. Since September 2015, the rate has moved back up slightly to 62.9 percent in September 2016. By the way, the falloff in the labor force has been attributed by many to an aging population. However, if we break 2007 and 2015 labor force data out by age groups, we see a very different story. As noted in Table 1, it turns out that the labor force participation rate was lower in 2015 for all age groups except those 55 years and up. So, when comparing the labor force participation rates of age groups in 2015 and 2007, it turns out that the decline in the labor force due to lower participation rates is all about the age groups below 55 years old. That is, the labor force in 2015 was down by 13.1 million compared to where it should have been at reasonable participation rates for ages 16 to 54. Data Source: FRED (Federal Reserve Economic Data, St. Louis Federal Reserve Bank, https://fred.stlouisfed.org , and The Employment Situation – September 2016, U.S. Bureau of Labor Statistics, October 7, 2016. 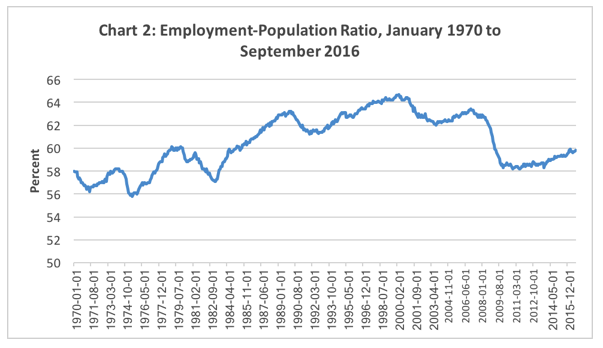 Over the past several decades (as noted in Chart 2), the employment-population ratio dips during recessions, but the general trend had been higher. After the recession of 2001, the lackluster recovery failed to bring the ratio back up to previous levels. For example, the employment-population ratio hit a high of 64.7 percent in April 2001, and then fell to 62.0 percent in September 2003. The ratio subsequently rose to 63.4 percent of December 2006. Subsequently, especially once the recession kicked in, the decline was dramatic, eventually bottoming at 58.2 percent in late 2010 and at various points in 2011. Such lows had not previously been seen since the early 1980s. As of September 2016, the employment-population ratio climbed back to 59.8 percent. That compared to a pre-recession level of 63.0 percent. Therefore, in September 2016, if the employment-population ratio had registered 63.0 percent – again, where it was just before the recession started – the U.S. level of employment would have been 160.08 million, as opposed to the actual 151.97 million. That is, employment in September 2016 was down by 8.1 million compared to where it should have been at a reasonable employment-population ratio. Over the last several years, the labor force and employment numbers have been spun in a variety of ways to deflect attention from the data. But the numbers clearly show a dramatic exodus of workers from the labor force and a drastic shortfall, or gap, in terms of employment. And this is all about an environment of increased costs and uncertainties that have diminished entrepreneurship and investment (as noted in earlier SBE Council “Gap” analyses), which in turn has reduced economic and employment growth. To support SBE Council, or to join as an ADVOCATE for Free please click here.